C F Roofing Services - Roofer based in Eastbourne, East Sussex. 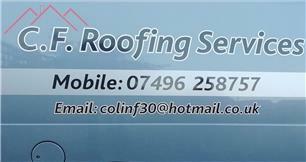 Hi my name is Colin from CF Roofing Services I have been roofing around Eastbourne from about 2002. Since then I have completed many projects which I am extremely proud of. I've also met some lovely people which is a great part of the job. If you find yourself in need of a friendly professional roofer please call to chat.